My phone is not my own. As much as I chanted to myself that I would not share my smart phone with my littles…. it happened. I fought it… I really did. But, it happened one day in a dressing room when I needed five minutes to myself to try on a few pieces of clothing for a trip. The children had been shopping with me for longer than they liked and they needed a little distraction. That little handoff opened up the floodgates of “Can I have your phone?”. 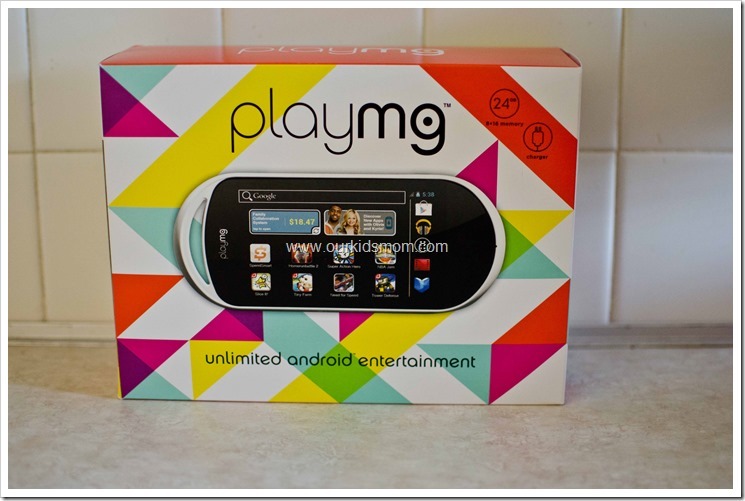 When I was offered the opportunity to review the PlayMG, a smartphone that is not a phone, I was more than game. PlayMG is a pocketable all-in-one entertainment system specifically designed for young people who do not have a smartphone. There are no monthly charges or expensive cartridge games to buy and PlayMG gives you access to everything on the Google Play Android platform. 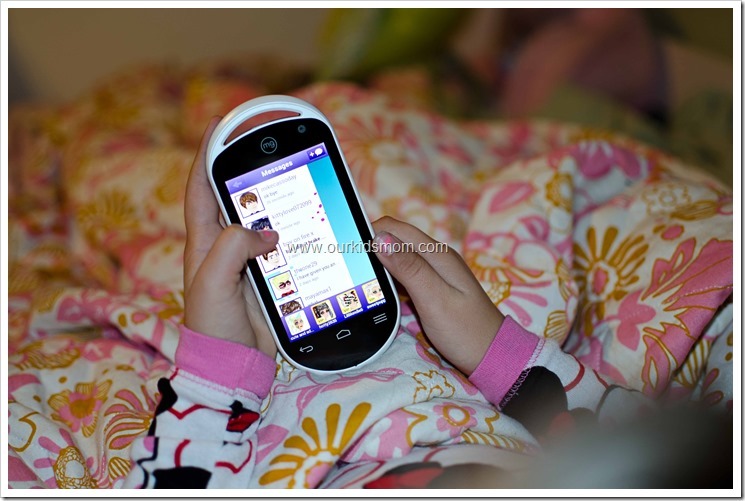 With PlayMG, young people get their own smart-device and parents get their smartphones back. PlayMG functions over Wireless Internet which makes it perfect for at home use or on the go connected to my mobile hot spot. One of the unique features of the PlayMG is the Family Collaboration System. 1. Provides An Optional Email Notification For Remote Monitoring. Young people get to enjoy unlimited apps and parents get to “trust but verify” through weekly email usage reports. 2. No More Over Spending With An Easy to Use Prepaid MasterCard. Unlike competitive brands, Moms and Dads won’t get surprise credit card bills with $1,000’s of app spending. Included with every PlayMG is an optional dedicated SpendSmart™ Prepaid MasterCard that helps manage app spending through a real-time balance on your home screen! Think about it… no more “Mom? Can I download this app?” with several .99 charges adding up. Deposit their allowance into their account and they are responsible for their own funds management. Out of money? No paid downloads! Our PlayMG arrived needing a little battery boost. My poor Ethan could barely stand it, so I plugged it into my computer and started downloading some of his favorite apps from Google Play. 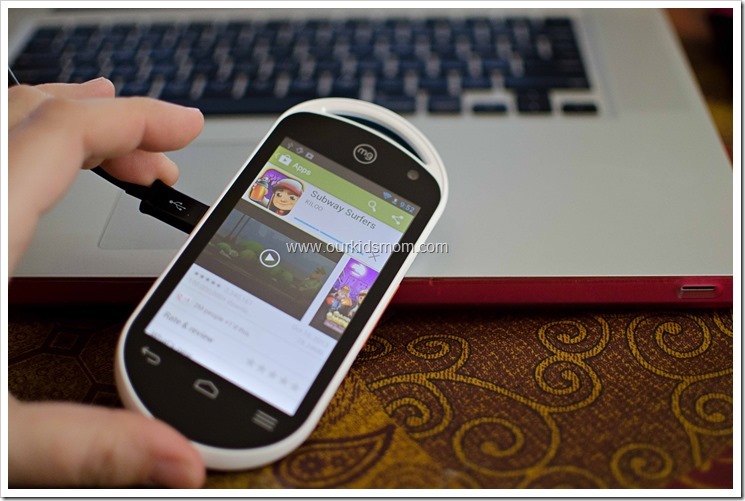 The Google Play Store combined with PlayMG offers unlimited android entertainment. 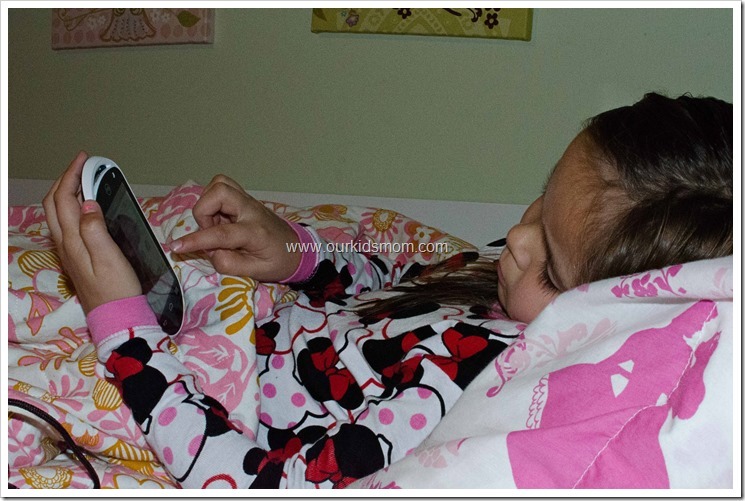 Every app my two littles have grown to love was available on the PlayMG. With WiFi access to the Google Play store you have an endless amount of apps, games, music, movies, TV shows, books and much much more! It offers total access to the Internet. It is the perfect companion for the App Generation and the best part… it does not require an expensive monthly data plan! PlayMG offers big expandable memory. Depending on the box you purchased, it comes with 8GB to 40GB of memory and more can be added – unlike leading competitive brands that have fixed memory. 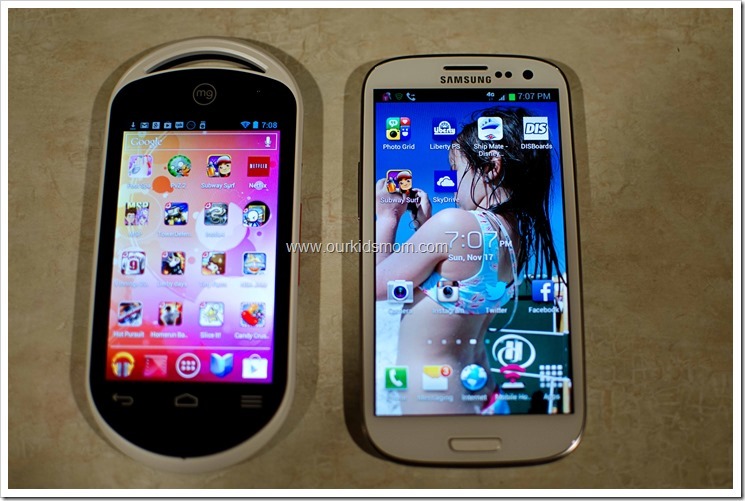 The photo above shows the PlayMG (on the left) next to my Samsung Galaxy SIII (the phone my littles have grown to love). Initially they look almost identical in size. 1880mAh for Long-life battery (3.75 hours Play time, 4+ days stand-by). The lock screen options are almost identical between the two. As soon as Ethan saw the PlayMG lock screen he felt confident he knew how to use it. 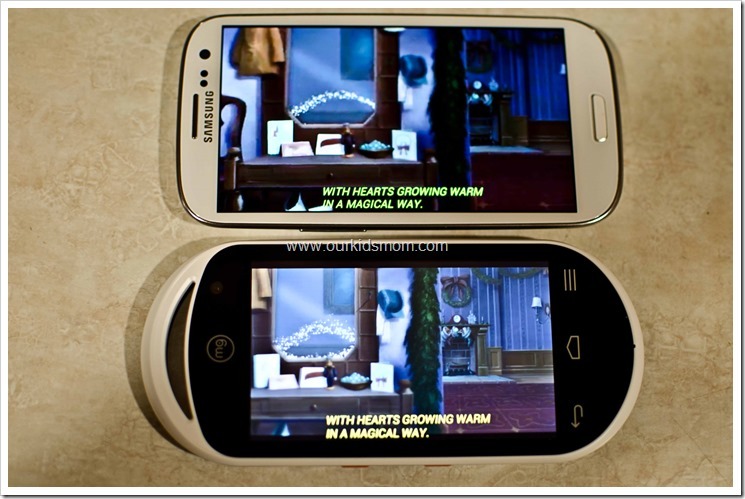 Above you see the screen display side by side with the Galaxy SIII. Even though they aren’t the same, the PlayMG screen is still a decent size and comparable to a standard sized smart phone. The home screen of the PlayMG is layed out very similarly to my cell phone as well. Everything about the PlayMG made me feel comfortable in handing it over to my 5 and 7 year olds without having an instructional demo with them beforehand. One of the littles favorite things to do is watch Netflix on my phone. If Netflix doesn’t function then the device is abandoned. Here you can see the screen is more than ample to view the movie while offering a crisp picture. As you can see, the PlayMG fits in my 7 year old’s hands nicely. She is able to grip with one hand while scrolling and manipulating with the other without issue. Ethan doesn’t know how to spell yet, but Emma uses chat in Movie Star Planet often and hasn’t had any issues with the keyboard size. In fact, Emma has grown fond of the PlayMG and will sneak off with it to enjoy some alone time without her 5 year old brother breathing over her shoulder. As much as my children have fallen in love with PlayMG, I am more relieved to finally have my smart phone back and to be able to wipe some of the children’s apps from my screen and replace them with apps for ME! Now that you don’t want Mom’s smart phone anymore… which of the 60,000 apps do you download first? 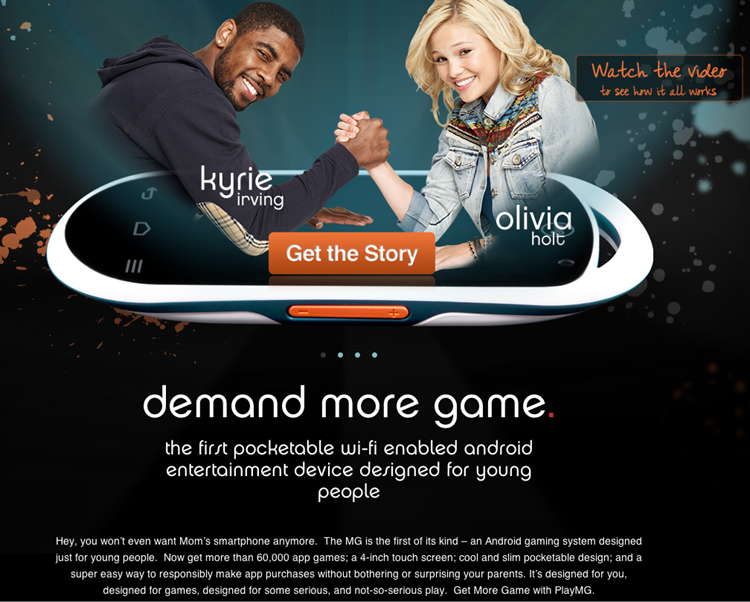 PlayMG partners/owners Olivia Holt and Basketball All Star Kyrie Irving will help you discover new apps and the recommendation engine will make suggestions based on what you play most. Our overall experience with PlayMG over the past week has been fabulous! With a little patience when it first turns on (the kids expect it to bounce right into the home screen… I tell them it has to wake up and think a little) they have their own smart phone without the phone part (which they don’t need anyway!). If you had no idea what it was and picked it up to inspect it… you would assume it was an Android phone. It’s the best of both worlds! ONE OurKidsMom reader is going to win a PlayMG! This giveaway ended at 11:59 PM EST on November 26, 2013. I love how small and portable it is! My son has an ipad but this would fit in his pocket for when he is out and about. I like how it has expandable memory- unlike the ‘other’ devices that are limited. I feel this is important. I also like how games are much less expeensive than say the apple brands you get more bang for your buck. I love the “Digital Wallet” and “Remote Trust” feature! Looks like a really awesome device for kids! This is sooo cool!! I’d love to win it!! I love the fact they can play on their own and free up your phone. Would be awesome for the girls. I love that it comes preloading with games! My children love to play on my cell phone, especially in town but it makes my battery die! This would be perfect! I love that it can teach responsibility while giving my son a safe way to stay entertained. I love this and it would be great for my lil girl!!! I love that it can have all the android apps that my phone has. I can finally get my phone back…YAY!! 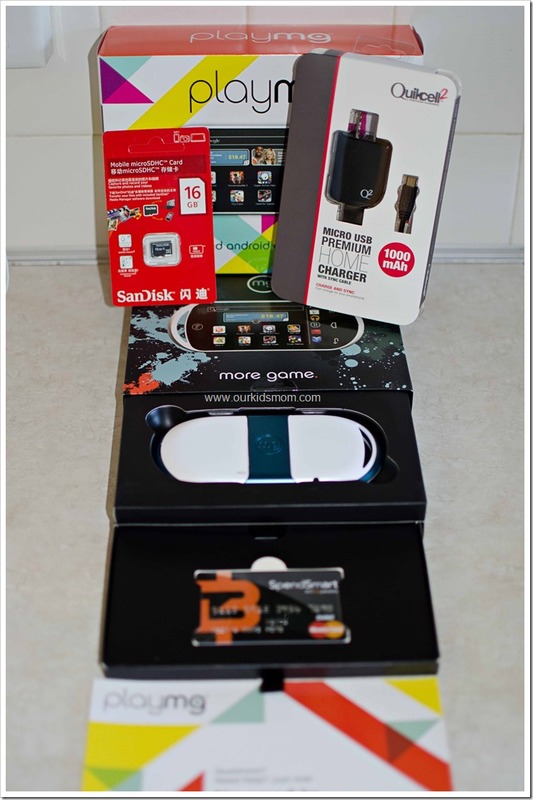 I like the digital wallet and want most everything. I love that you can preload it so that there are no unexpected charges! I like that they have so many app games, 60,000, to choose from. on a contract. I have never heard of anything like this. I need my phone back from my boys!! This is amazing idea!! Hope to win!! I have never heard of this before but it would be perfect for my youngest. She is always asking to play my phone! I like the Remote Trust feature. I like that it’s about the size of a phone . My daughter would love PlayMG’s Twitter app. I like that the MG allows kids to have their own system, without getting a smartphone and the expensive monthly plans that come with it. I love that it’s Android based! I really like that when you sign up for the SpendSmart™ prepaid MasterCard® and add at least $10, they’ll match it with an additional $10. I like that it is small enough to be traveled with easily. I love that you can load an “allowance” right on the device so your kids can pick their own games! 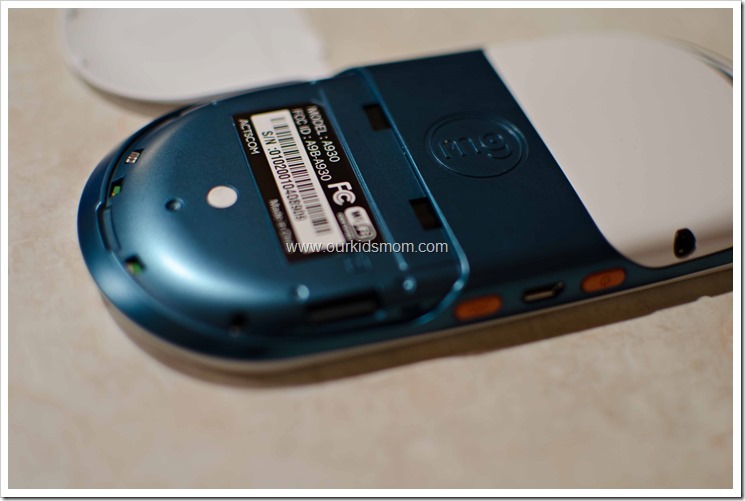 I love that it is small and easy t use, can put apps on it for my son fun and educational! I love the size. So much more comfortable toting this around rather than an iPad….way lighter and smaller. I like the family collaboration system. No unexpected charges. I love that their is so many apps to choose from. I think it’s great for all ages to use,too. I like the remote trust feature! You don’t have to worry about surprise charges! I like the digital wallet and remote trust that keep kids from charging tons of stuff to your account. That is a great benefit! I like that it’s child friendly. 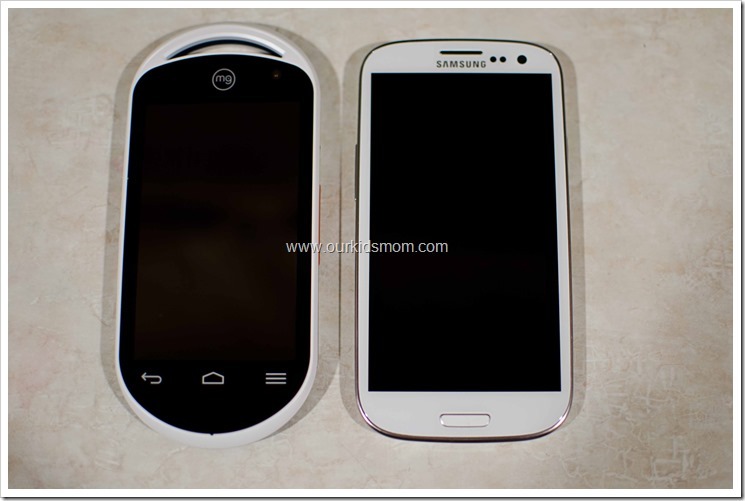 I love that it is a pocket sized Android device other than my phone. Perfect for the kids to use and will link up to Google Play. I like that it has a a trust-but-verify tool that keeps you in the loop on their activity. I like to know what my kid is actually doing. I like that it is preloaded with a lot of apps. It comes preloaded with games! I love that it comes with games on it! Oh, and that my kids wouldn’t kill my battery by noon every day! I like that it comes preloaded with top games. I like the SpendSmart system of prepaying for apps or add ons that you get. Great way to set up an app allowance for my app crazy kids! I learned that MG is the first portable Android gaming system designed specifically for children. I love that it comes preloaded with games! I think my little girls would enjoy playing Derby Days; it looks like a fun game. Thank you for sharing. 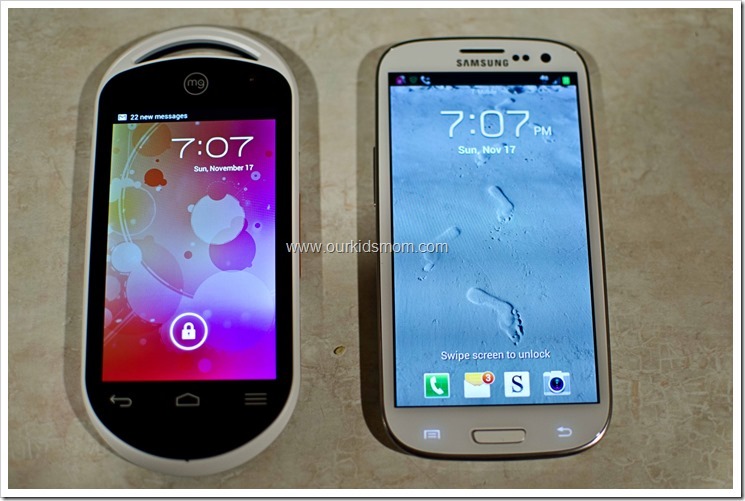 I like that it’s touch screen and has a expandable memory! I like the Family Collaboration System. I like how it’s designed just like a smartphone! The kids wouldn’t always beg for my phone! I like that you can load it with a certain amount of money for spending on games. I love that it is like a phone, with out the phone! My son would die if he opened this up on Christmas! It would be a Christmas Miracle! I learned PlayMG’s “Digital Wallet” and “Remote Trust” notification functions are entirely new to portable gaming. I really like that I can track their usage… sometimes they slip off and I have no idea who has been on what for how long…with 4 kids all in their own rooms, it becomes a matter of tracking everyone down! I like the the digital wallet feature, and the play mg comes with preloaded games. I like that it’s made for kids so I don’t have to worry about app purchases. there’s lots of apps to choose from! i like that there’s no contract and you can get games from the google play store! Oh, I have never seen this one, we need a couple of those! I like the digital wallet. Brilliant! I love the “digital wallet” so there are no surprises. I hate seeing surprise charges in my account. You mean I could have my phone back??!! Sign me up!! I like the spending card and email notifications. Allows mom and dad to keep track of what’s going on. I like that there is 60,000 app games for it. I learned it comes preloaded with some top games. I like that it comes preloaded and you don’t have to buy extras! love the preloaded apps and no contract! i really like that you can play games on there! my husband would love that feature! I like that I don’t have to worry about surprise charges. I’ve had too many of those! My kids would love this PlayMG. And they’d like the PlayMG Ocean Blue Lanyard by PuraVida too! Love that it comes preloaded with some premium games! I like the Inotia 4 game app! My 6 year old would love this and then I can get my smart phone back and remove some of his games! This looks like such an amazing product and I love all the capabilities it has!! I love the variety of games they have on their site. I love that it offers games-only content so kids can have a small device to play on without all the added “extras” that come with a smartphone. I like that it’s a games-only device for kids, so they can feel free to play on their own device without all the “extras” of a smartphone. I learned that PlayMG’s “Digital Wallet” lets parents create “game allowances” through a reloadable SpendSmart™ prepaid MasterCard®. This is the first portable gaming device to offer this feature. I learned that it is a gaming device like a smartphone where your child can download apps. As a parent you can control your childs spending with a pre-paid card. PlayMG’s “Digital Wallet” and “Remote Trust” notification functions are entirely new to portable gaming. Parents no longer need to worry about surprise charges, or be hassled every time their teen wants to buy a 99-cent app or make an in-game purchase. What a smart way to get my son off of my digital media and let him play games on his own system. I love that it’s a smart phone without the phone. She is 9 and does not need a phone. I was very impressed when I read that the PlayMG offers expandable memory. 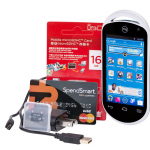 My favorite is that it comes with a SpendSmart Prepaid MasterCard that helps manage app spending. How awesome is that. No overspending Mom’s money. She wants new apps she can apply her allowance to buy them. Thanks for sharing this review about the PlayMG. I leakiest the fact that they can only download apps you have okay’ed. I learned that I can buy it at target! I want the 40gb PlayMG. I like that no cartridges are needed. Expandlememory. Great formy kids who.always want to.play games on mommys.phone! The expendable memory and that it’s portable. I love that the games are already loaded into gaming unit!!! 60,000 game apps is a lot of options! I learned that Parents no longer need to worry about surprise charges, or be hassled every time their teen wants to buy a 99-cent app or make an in-game purchase. This also applies to my 10 yr old Grandson. I am amazed by how many apps there are available for download! My daughter would love this! I love how it uses yhe same apps as my phone so the kids wont get bored quickly. I really like the digital wallet feature so there aren’t any unexpected charges! i love that there is a ton of games to choose from! I like that it comes preloaded with so many apps so that when you get it you don’t have to spend extra money buying a bunch of games for your kids to play! I like that there is no contract! I love all of the apps! There is something for everyone! I love all of the apps! There is something for everyone in the family! I love that it comes preloaded with so many games. And my daughter can’t call someone or charge massive things to my google account. Thank you for the giveaway. I love the “Family Collaboration System” and that I can get it at Target! I’m learned that it is just for games, which is a good thing. Thanks for the giveaway. It has pre loaded apps on it. Love that it is small and looks like my phone! Maybe my kids would leave my phone alone! I really like that this is just like my phone but without the calls and texting or the big fat bill that my Daughter is too young to have. She wants a smart phone, but I think she too young for texting and calling. There is a happy medium. I love that it has games on it already. This would be a great way for me to get my ipad back! I like the expandable memory. I love how it’s small and portable and like a smartphone. This would be perfect for my kids!!! I like the cool sleek design. NBA Jam game for my son Niko. I love that there are no cartridges to keep up with and that it works just like a smart phone, as far as apps, games, etc. I could have MY phone actually be MY phone! I didn’t even realize they made something like this. It comes pre loaded with games I totally want one of these for my daughter so she can leave my phone alone. I LOVE NO MONTHLY DATA PLAN! Love the front facing camera, my son could easily work w/that! (my comment keeps disappearing..) I love the portability and the size, easy to slip into a pocket! Love that you don’t need another monthly payment and can monitor children’s activity. I learned that it lets you opt into “Remote Trust” notification system and receive email updates on MG activity… from a distance. i like the family collaboration plan. the whole idea of the product is just really neat. love that it comes preloaded with games. it’s so cool!! the gaming system. just what kids today want. I love the fact that you can be worry free about the kiddos buying those expensive ‘in game” coins or what not! I know first hand what a hassle that is, my daughter who was four at the time, spent like $17 on in game purchases and I had to make some phone calls to get it credited back! Grr…this would be perfect for my kiddos! Thanks so much! I like that you have access to all the Android games (I have an Android phone, so my daughter is used to playing those games anyway), but you don’t have to pay a monthly fee! Great idea! Oh, this looks cool. The parental features it mentions are just what I’ve been looking for to put on my tablet. I love the email notification feature! The Derby Days Let’s Ride looks fun! I learned that there are no surprise purchases. You load money onto the account and that is what is used. Really awesome feature! I love that there are no expensive monthly fees and it’s great for kids! I love the slim design and that there is no monthly charges!!!!! Wow, what a cool review. This would help my special needs granddaughter so much with her physical as well as mental needs. She is so behind in school, we could get it to enjoy games and hopefully learn too. Thank you for your help in this give away. I sure would love to win this item for her!!! How cool!! This is awesome. I love that it has preloaded apps! I like the parental controls, I can control even form a distance on how much they spend on games. I don’t have to be looking over their shoulders while they are on the MG, I can just look at the nifty report to see what they are up to. This is the number one item on my daughters Wish List. She is always trying to play with my phone. Playmg has some really great games too. I love this! I love that it comes preloaded with free apps, so we can get playing right away without having to wait for downloads. I love that there are so many apps for this. More portable than a tablet, easy to keep tabs on, great for kids who can not have a cell phone, expandable storage… this thing is awesome! Huh, the size is really impressive. It’s basically a cheaper version of, say, an iTouch. Pretty clever, in my opinion. This is just absolutely amazing. I love that it’s android operating system. It’s also great that it has pre-loaded games. I really like this device and so many things about it. I like that it is wireless and that it is android. I aalso like how it comes with a card that can be loaded with $110 and you get a $20 credit to show responsibilty. I have entered for one of these everywjere and I swear I will keep entering I am so impressed! I love the email monitoring system! Thank you for the opportunity to win such a great prize! It would be awesome to win this for my son. This looks like so much fun. I would love to get one for my daughter. I would love this for my kids! They always want to play games on my phone, so this would be perfect for them! My kids would love it if we had one of these! I don’t have a smart phone and we don’t own any tablets so they don’t have anything to play games on. I would love this for my son. his tablet is not working and I’d love something small to keep in my bag when we are out so he has something to keep him busy when needed. ONe thing I really like about this is that you can load a certain amount of money per user for the purchase and download of apps. No data plan is a huge bonus! Oh I’d love my phone to belong to me again! This is such a great device! And I agree that it would save wear and tear on all of our smart phones and iPads! Love how this can save a phone battery. Even I have a tendency to run a battery down. This would be great to win. I love this!My son would leave my phone alone and It already has games on it and I can add more! !